Fly to Key West in our Cirrus SR22 three passenger charter plane and get there in 42 minutes from the Miami Executive Airport (formerly known as the Kendall-Tamiami Airport). There’s no faster way to get to Key West and the view is beautiful. I can also fly you from any of the three major South Florida Airports: Miami International Airport (MIA), Ft. Lauderdale (FLL), or West Palm Beach (PBI). We also fly passengers from Orlando and Tampa Airports. All these airports have modern private terminals which provide free shuttle service from the airline terminal to our plane. We arrange everything for you. Just give me your flight information and I’ll send you instructions for the transfer. Your flight to Key West will take you over Marathon and the seven-mile bridge, then south along the Keys until we reach Key West. 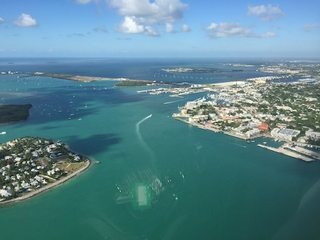 Usually, I pass south of Key West before we begin our landing approach which gives you a excellent picture taking opportunity of the island city. Everyone I have ever flown to Key West enjoys the experience. I think you will too. Let me know which hotel you're staying at and I’ll call them to have transportation waiting for you when we arrive. Otherwise, you may have to wait about ten minutes after arriving.